Creative Labs wants people to fall in love with PC audio again. That’s a challenging task at a time when even gamers who drop big bucks on video-card upgrades think of sound cards as anachronisms. Creative’s strategy: Cover all the bases with a new family of USB audio devices and headphone amps ranging in price from $50 to $400. I’ll start with the most ambitious new product in the family, the Sound Blaster X7, which Creative product manager Ryan Schlieper demoed for me on Wednesday. The audacious industrial design might turn off some audio purists, but it’ll be right at home on a desktop or atop a gaming tower (even if you’re rockin’ the new Alienware Area 51). A wire rack connected to the back of the device provides a convenient place to hang your headphones. “Management complained because they’d have to make the box bigger to accommodate the rack,” Schlieper said. “But I told them ‘Come on, you gotta do it! It’s so perfect!’” He’s right, of course; I have nowhere to put my cans when they’re not on my head. The X7's form factor might be awkward for an 19-inch entertainment center, but it's great for a desktop or the top of a tower PC. While the X7 is powered by Creative’s SB-Axx1 audio processor, this box is much more than just an external sound card. It also houses a 100-watt amplifier to drive a pair of bookshelf speakers; a high-power headphone amp to support two pairs of headphones; a beam-forming microphone for gaming, video conferencing, and room calibration; a Bluetooth receiver that supports both aptX and AAC codecs for audio streaming from up to two tablets, smartphones, or other devices simultaneously; an NFC transceiver for Bluetooth device pairing; USB connectivity for hardwired audio streaming from a PC or Mac (asynchronous mode USB audio is supported to reduce jitter, or timing errors, and ASIO support is provided to reduce latency during the decoding process); and USB host connectivity for audio streaming from a tablet or smartphone. Finally, there’s a second USB port for charging the battery in a small device. In addition to Creative’s own audio processor, the X7 features a Burr-Brown PCM1794 DAC that can convert high-resolution audio files (tracks encoded with up to 24-bit resolution and sampling rates as high as 192kHz) at a signal-to-noise (SNR) ratio of 127dB; a Burr-Brown PCM4220 ADC for converting analog audio to digital (for recording to the PC’s hard drive) at up to 24-bit resolution and up to a 192kHz sampling rate; a Texas Instruments TPA6120A2 headphone amp that can drive two sets of phones with up to 600 ohms impedance; and the aforementioned 100-watt amplifier. That last spec does come with some caveats: The Texas Instruments TPA3116D2 Class D amp Creative is using drives two four-ohm channels at 50 watts each (many bookshelf speakers present eight ohms of impedance), and you’ll need to buy an optional 24-volt/6-amp power supply to do that. The supplied power adapter only enables the amp to drive two four-ohm channels at 37 watts each, and that drops to 30 watts per channel if you're connecting 8-ohm speakers. As with some of Asus’s high-end USB audio devices—including the Xonar Essence One—Creative allows you to swap out the X7’s op/amps for anything you find more sonically pleasing. Just pop off the door on the bottom of the device to expose the socketed parts. 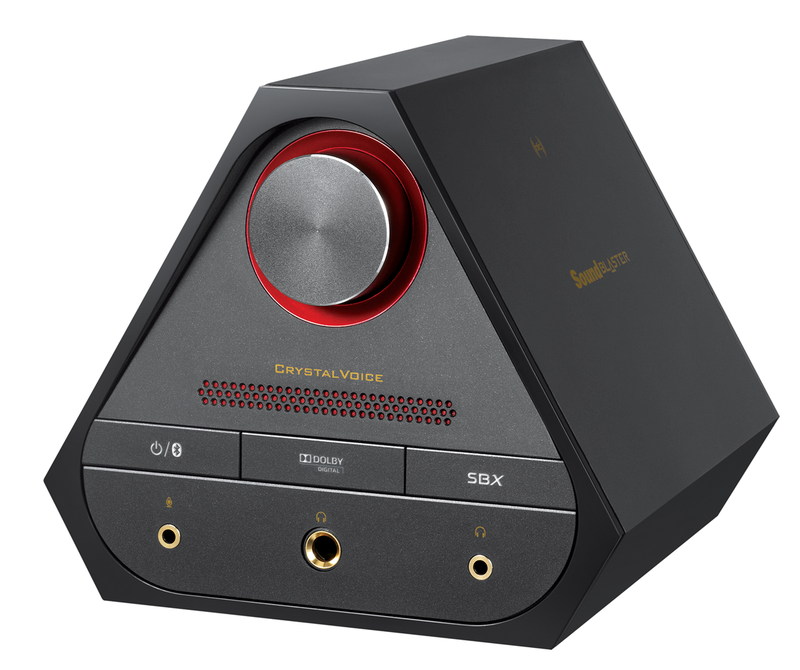 The X7 has all the audio effects that modern Sound Blaster products are known for, including SBX Crystalizer (great for restoring life to MP3s, but I think it can add to most any track), SBX Bass (for boosting low-frequency effects, or LFE), and SBX Smart Volume (for minimizing abrupt changes in volume, such as during commercial TV breaks). 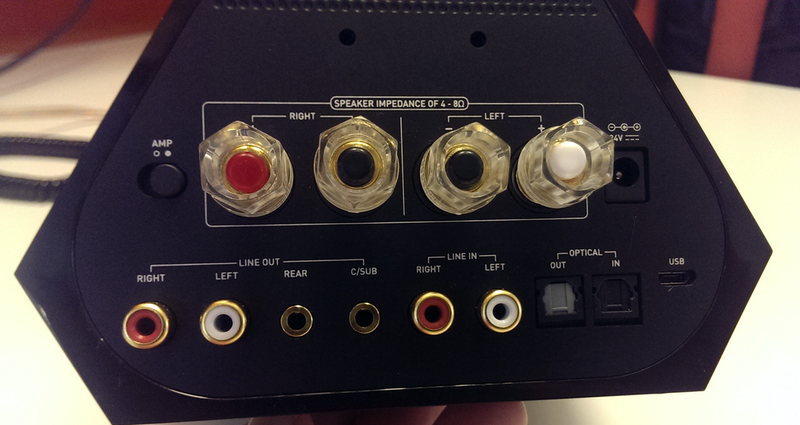 The box can also decode Dolby Digital and output six discrete channels (front right/left, surround right/left, center, and a subwoofer for LFE). The EX7 cannot, however, decode Dolby TrueHD or DTS-HD Master Audio, high-definition audio codecs featured most in Blu-ray discs. You can push a button on the front panel to defeat all of the SBX effects, but Creative has also developed controller apps for Android and iOS devices (a Windows version is coming soon) that exposes individual controls, including the ability to calibrate connected speakers to the room using the built-in mic. (You can also apply audio effects to the incoming mic signal to change the sound of your voice in real time.) The front panel also has an oversized volume control, an 1/8-inch analog mic input, a 1/4-inch headphone output, and an 1/8-inch headphone output. 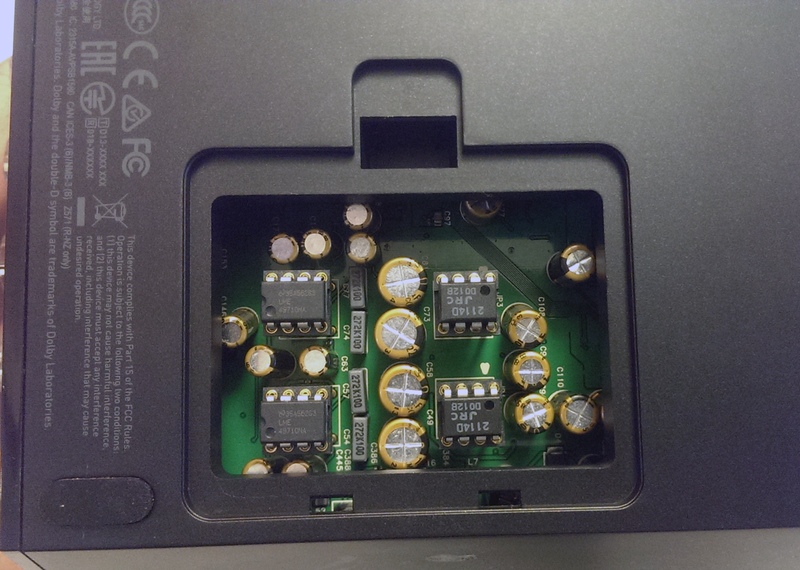 The X7 can support a 5.1-channel home-theater system, but it's decoding capabilities are limited to Dolby Digital. On the rear panel, you’ll find a switch for toggling the amp to drive 4- or 8-ohm speakers, two-way binding posts (bare wire or banana plugs), right/left RCA audio outputs (plus 1/8-inch outs for right/left surround and center/sub), right/left RCA audio inputs, optical S/PDIF inputs and outputs, a micro USB port, and the holes for that awesome headphone rack. Creative expects the X7 to fetch $400 when it becomes available in December. Stay tuned for my hands-on review. 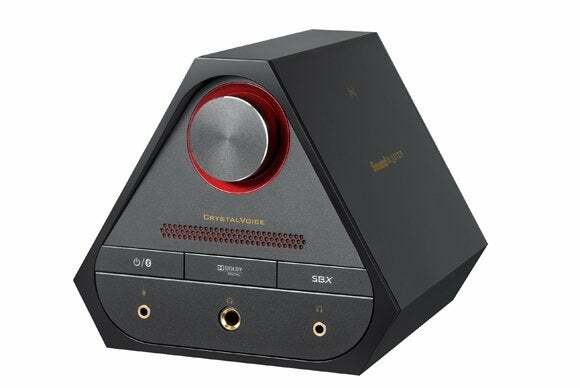 The Sound Blaster E1 and E3 were launched last May, and the E5 was announced on August 26. All three are portable, battery-powered, USB audio devices and headphone devices designed to work with PCs and Macs as well as smartphones, tablets, and digital media players. The three products scale up in features and capabilities, but they all have built-in mics and dual headphone outputs. Schlieper told me each of them can drive high-impedance headphones (up to 600 ohms). The E1 ($45 street price) is the simplest of the three, but Creative says it can deliver an impressive SNR of 106dB. The E3 ($129 MSRP, not yet widely available at retail) adds Bluetooth and NFC capabilities along with a DAC that provides a slightly higher SNR of 110dB. The Sound Blaster E3 is a portable USB DAC and headphone amp that also supports Bluetooth and NFC. 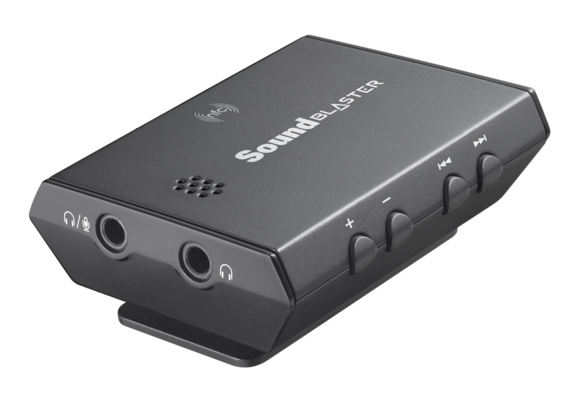 Schlieper left me with an evaluation sample of the recently announced $200 Sound Blaster E5, so I won’t go into too much depth about that device here (I’ll save it for my coming review). This model features Creative’s SB-AXX1 audio chip, and it includes all the features in the E1 and E3, plus aptX codec support, support for high-res audio, and more. I think we’re in the midst of a PC audio renaissance. Ad Lib and then Creative led us out of the Dark Age of PC audio when computers generated nothing more than bleeps and bloops. The Middle Ages (the mid- to late 1990s) saw huge improvements in gaming audio, with Aureal Semiconductor and Creative battling to see who could produce the best positional audio effects for PC games (Creative ultimately won, although the victory wasn’t entirely fair, in my opinion). Still, each new generation of sound card introduced new audio capabilities and higher fidelity. On a parallel track, PCs gained the ability to play audio CDs, and speaker manufacturers began building excellent desktop 2.1-channel speaker systems. Cambridge SoundWorks’ MicroWorks system was the epitome of that trend. But then came the MP3 craze, and by the turn of the century, everyone began to care more about file sizes (and free music) than they did audio quality. MP3s didn’t plunge us back into the Dark Ages, but they did make a lot of people forget what great music sounds like. Microsoft, meanwhile, screwed up gaming audio with the introduction of its Universal Audio Architecture (UAA) for Windows Vista in 2002. UAA made it very difficult to advance the state of the art in gaming audio. On the bright side, UAA also helped foster the idea of outputting digital audio over USB for conversion by an external DAC. Early products sounded terrible due to jitter, low-quality DACs, and other issues, but the industry eventually overcame those problems. New codecs such as FLAC and AAC made it possible to shrink audio files without losing fidelity, and a few distributors began selling high-resolution audio recordings online (although both the Super Audio CD and DVD-Audio initiatives flopped). Today, there’s a whole universe of USB DACs, headphone amps, desktop speakers, headphones, and ear buds on the market. And you needn’t spend a great deal of money to get a high-quality product. I’ll soon let you know if Creative’s latest devices fit that description. Correction: This story was updated shortly after publication to report that the Sound Blaster X7 has one TI TPA6120A2 headphone amp.